We have NEW pictures! yahoo! 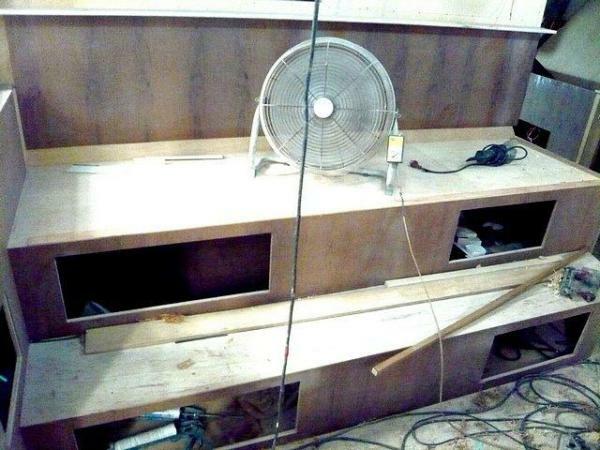 This picture and the one below it are the latest on the salon settee and galley. Here is the early makings of the port interior wall in which we will have a TV hidden that lifts up for viewing. cool, huh? This is also on the port side interior wall, just forward of the tv wall. 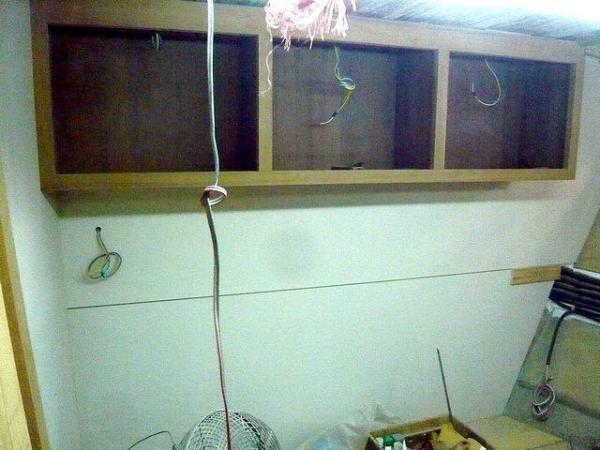 These cabinets will house galley storage, a wine cooler below and a lighted cabinet above. Though it is covered for protection, the counter top is a beautiful black/white/gray granite counter. This is the port side map table and a hint of the pilothouse helm station. 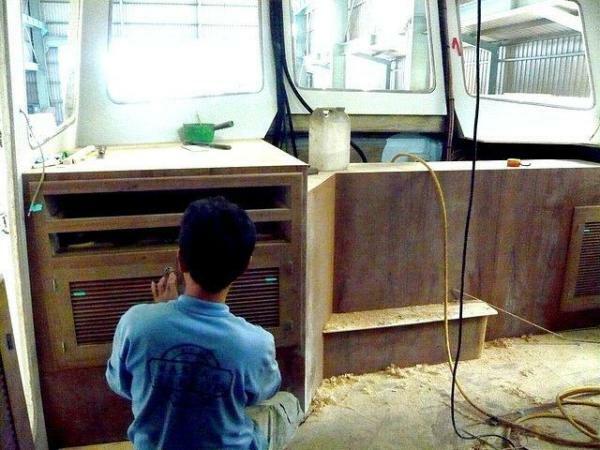 These are the pilothouse port side cabinets for electrical and entry upstairs from the salon/galley a few steps below. The pilothouse settee... so far. 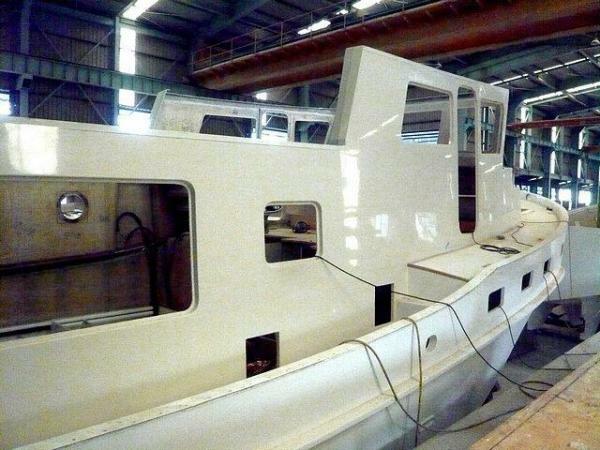 and a larger view across the pilothouse, putting it all together. View from the salon looking forward to the pilot house. galley on right. Master stateroom with queen size v-berth platform. Guest stateroom/office. 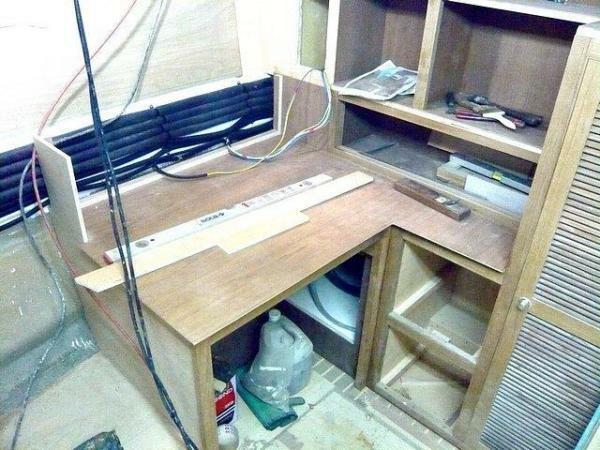 so far working on the cabinetry on the forward section. Pilothouse helm station and map table. Pictures of the outside again..... updated, of course. Here is the engine room showing the beautiful John Deere engine, 1 of the fuel tanks and the framing to the forward master stateroom, both heads and guest stateroom/office. Here the pilot house sole is being attached to the hull. 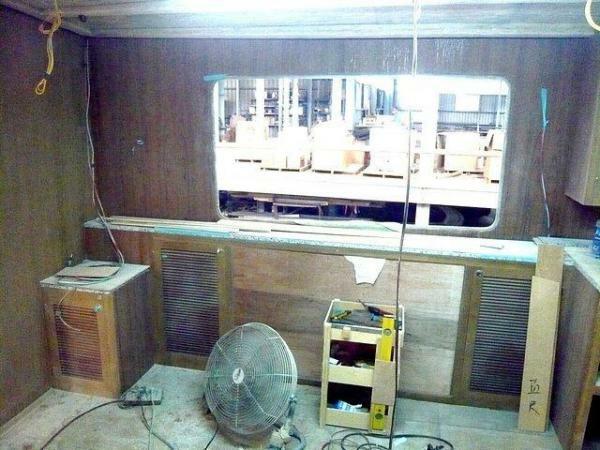 Here you can see some of the salon/galley level details on the starboard side. That cute square window will be right next to the viking stove! Now it's starting to make sense! The front-facing worker is standing inside the guest stateroom/office. The other guy is working in the master head. All 3 fuel tanks (1000 gallons) are visible in the foreground. The roof over the workers' heads will be the floor to the pilot house.